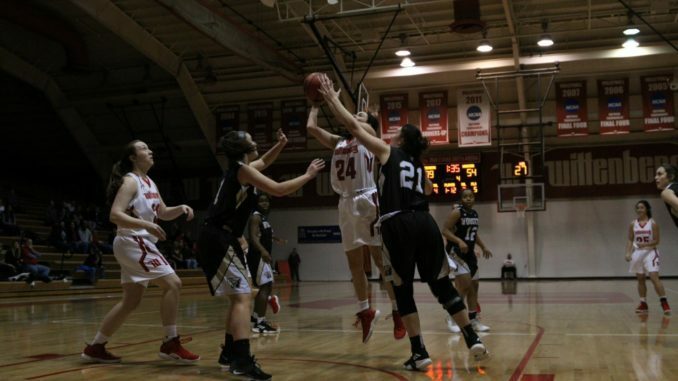 On Wednesday, Jan.16 in Pam Evans-Smith Arena, Wittenberg’s Women’s Basketball team defeated the Ohio Wesleyan Battling Bishops by the score of 56-45. This contest was very physical and fast paced. Koryne Berner, ’20, played an outstanding game. She recorded her first double-double at Wittenberg, after scoring 14 points and 11 rebounds, along with one steal and one assist. Wittenberg had tremendous effort from their bench, as they were able to score 34 points. The Tigers’ bench outscored the Bishops’ by 19 points. The Bishops won the tip-off, they were able to score first to jump out to an early lead by the score of 9-3. The Tigers’ offensive game started off slow because their shots weren’t making it into the basket. The offense could not generate any momentum because they were turning the ball over. The offense did not get into gear until Berner came off the bench. She made the team’s first jump shot of the night. The Bishops ended the first quarter with the lead of 15-9. During the start of the second quarter Ohio Wesleyan caught the hot hand and they jumped out to a 22-11 lead. The Tigers were getting out rebounded and were not having any opportunity to score second chance points. At the end of the game Wittenberg, ended up leading in rebounds, 44 to 30. The Tigers were able to keep cutting into the lead by rebounding and utilizing their defense play. Multiple Wittenberg players were able to put some points on the board, they cut the lead down to six points with less than three minutes before halftime. At this point of the game the Tigers were starting to take momentum of the game. Alex Kiess, ’19, was able to knock down a three-pointer to cut the lead down to three points. Abigail Yunker, ’21, made a buzzer beater to tie the game at 24 apiece heading in the second half of the game. Ohio Wesleyan was the first team to score in the second half of the game. In the third quarter, both teams were trading buckets back and forth. This quarter was the most physical throughout the entire game. The Tigers were able to make their jump shots and free throws, which slightly hurt them in the first half of the game, at a constant rate. While their offensive game was heating up, their defensive game was the reason the lead was increasing. At the end of the third quarter Wittenberg led the game by a score of 42-36. The final quarter of the contest was very entertaining. Ohio Wesleyan realized that the game was slipping out of their hand; so they substituted four new players to give them more energy from the bench. This tactic worked; the Bishops were able to cut the lead down to two points, 47-45, with less than five minutes left, but their efforts failed. The remaining points were scored by sophomore, Kristie Kalis, ’21; Sydney Mayle, ’19; Berner and Delaney Williams, ’21. The next home game for the Tigers is January 23 back in Pam Evans-Smith Arena, against DePauw University.